When Does Historical Revisionism Become Alternate History? I hadn't realized how many quasi-revisionist works about the Nazis and the Holocaust had come out recently until I read this Times article. It's almost like a stealth Man In The High Castle. Except that in this alternate history, the Nazis don't win — they get softened. They become not quite so bad. There's the spate of fake or incorrect Holocaust memoirs — I didn't realize there had been three recently — including, most famously, Angel At The Fence, which makes the Holocaust into the jumping-off point for a beautiful love story. 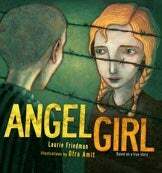 Holocaust survivors and critis have condemned Angel for understating how impossible it was for prisoners to have any contact with the outside world. And for possibly giving oxygen to the flames of holocaust deniers. Then there's the spate of movies that humanize the Nazis and add nuance to the Holocaust picture, like The Reader, in which a boy has an affair with a former concentration camp guard. The Boy In The Striped Pajamas tells of the friendship between an inmate and the commandant's son. And then there's Tom Cruise's heroic eyepatch-wearing Nazi in Valkyrie. It makes you wonder exactly where the line between alternate history and historical revisionism lies. Any historian will tell you, the past is changing all the time. People rewrite past events based on new theories, new evidence, or just the need to win tenure. Sometimes the facts themselves change, sometimes it's just the emphasis, and sometimes it's the framework we place the facts into. In alternate history novels, meanwhile, usually there's one fact, or a tight cluster of facts, that changes. Someone doesn't die, someone wins a war instead of losing it, or someone invents the computer a hundred years early. It's comforting, in a way, because it implies the facts of history are actually fixed — we know exactly what happened in World War II and the Civil War, so we can guess what might happen if you change the outcome. In the end, part of the function of alternate history novels is to reassure us that the real past is what we think it is. To some extent all historical fiction is alternate history, because novelists always end up changing some historical facts to make their stories work dramatically and narratively. I'm wondering if some brave experimental novelist, somewhere, will find a way to show just how easy it is for this reinvented version history to become actually counterfactual. Or has it already been done, and I missed it?